She belts out notes as high as Eb5 without wavering in pitch for an extended period of time. 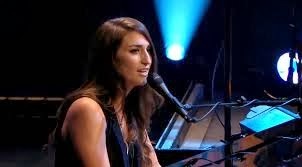 Her melismas are not overused and even though her strongest range, which is from F3 to Eb5, is where she finds home - her low notes at C#3 are used with good technique, and also pretty dark and well supported throughout the rest of her lower register. She possesses exceptional vibrato which allows her to go as high as G5 with little difficulty. There is nothing about her voice that makes me scream, 'Wow! I totally want to put her on the A* vocal grade' or something like that. Her voice is powerful and weighty, but everything else about her voice is either good or okay. Her voice above G5 becomes very uncontrolled, forced, and shrill at points, sometimes even nasal. Also, she has a somewhat unique timbre that is way too obvious to ignore.